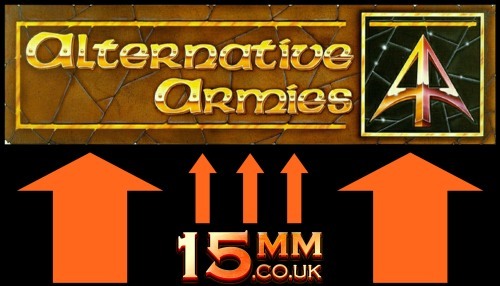 This is a major announcement by Alternative Armies concerning the future of its fellow website 15mm.co.uk. 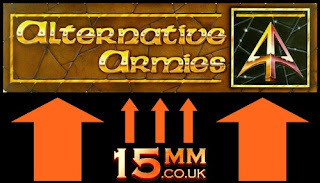 You will have noticed that the Alternative Armies website has a new look and is now even roomier. This is purposeful for the planned merger and features a new headline list of pages called '15mm Ranges'. We ask you to support us over the coming weeks of this merger and we will be happy to answer any questions you have. Contact us on sales@alternative-armies.com. We took this decision for many reasons including the maintenance time in multiple large websites, the commonality of customers across them and also our plans for the scales of 15mm and 28mm which we have for this and coming years. We know this is a surprise but all will be well and we are the same great people you already know and all of the miniatures, game systems and more you are familiar with will continue on. The team that runs both websites will continue as it is with one much larger website.